In an event a few years ago now, I worked with a poet and a composer in Sheffield. It was a pivitol exploratory moment for me as for the first time, I focussed on just sounds I was creating on Canvas as much as, if not more than on the visualisation. It was miked up, and I found it mesmerising and was excited by it. 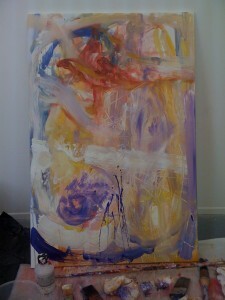 Previously, I had used this in a performance at Ronnie Scotts, when I miked some canvas’s up. I used this effect also, on a much larger scale in the performance at Modern Art Oxford, and then more recently at the South Bank with Cornelious Cardew’s Treatise Score. In these exciting performances, it felt as though there were no particularly barriers between the artforms. 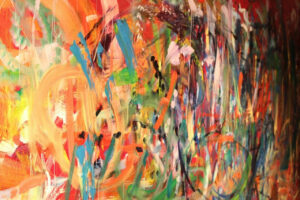 Sound, Notation, Painting, movement all became interlinked, becoming a cross sensory Jigsaw. In the last couple of weeks I received the original sound recordings from those performances and have been revisiting them and isolating the sounds. 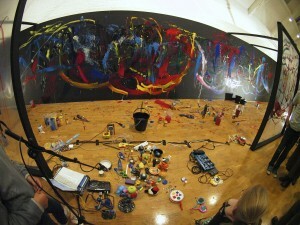 Not watching the performance painting is an odd experience though fascinating and fruitful. Surrounded as I am in my studio, by relics of performances. It makes me focus on the memory of certain moments and sounds. The sounds of a performance, the individual movements and associated traces are vital and an important part of telling the ongoing story of my work. Capturing and Curating the Moment. At present I am listening to Muhal Richard Abrams in my studio creating wonderful shifting chords and unexpected improvised colours. It is a recorded performance from around twenty years ago, yet sounding as if it is being created now. I’ve also recently been listening to some fresh sounding Anthony Braxton which is captured on vinyl with incredible artwork containing the shapes from whence the music came. Both these musicians continue to be a great influence on my work, and their forward thinking approach to music set up the Association for the advancement of Creative Musicians. 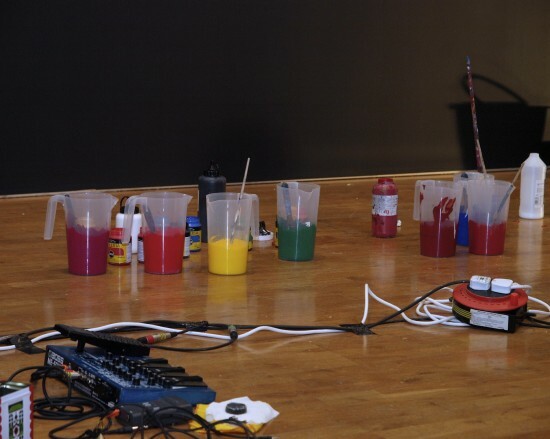 Artists using sound are using Vinyl in the same way as a way of capturing sound as a product, and recently there have been records released by Haroon Mirza, (whom I talked with last year) Martin Creed, and Christian Marclay. I am also becoming fascinated by the legacy of sounds created in my own performances. Distilling the essence of performance is always a dichotomy for me, of which I am constantly addressing in the work I make, especially recently, whereby I am collating performance work, speaking of which I have noticed recently that my performance paintings of years ago, in public collections can now be seen on the BBC “Your Paintings” website. Parts of my studio at the moment, remind me sometimes of my informative visits many years ago to John and Myfanwy Piper’s house and seeing their incredible mantelpieces and bookshelves with fascinating collections of things special to them and also more recently to Tom Phillips’ amazing house/Studio to which I recently visited. When Myfanwy Piper died in 1996, I was kindly allowed by the family and with Piper’s collaborator Geoffery Eastop to take documentary photographs of the house, some of these are in a recent book by Art Historian Frances Spalding on the Pipers. I saw Keith Jarrett recently at a rare London performance, and during the show I was incredibly aware of the preciousness of the moment, with the ability of this talented pianist to conjure and enhance, even vamp uniqueness in the moment, which I think perhaps makes him so popular with audiences. I was aware again of this capturing and enhancing a moment in a terrific talk by the great South African artist William Kentridge in Oxford recently about the process of making his art. It utilised film of him working to illustrate this, juxtaposed with him talking in person. It was most effective, almost making the talk itself become like the finished piece of work. Following this was a talk by the curator Ivo Mesquita who talked about the influence of Lina Bo Bardi on the way architecture can effect the curation of art, looking in particular at the Sao Paolo museum of Modern Art. Here the Artworks are excitingly suspended, enabling the viewer to navigate around it, enhancing the temporal quality of the art. There has also been a recent show curated by Hans Ulrich Obrist about Bo Bardi’s incredible glass house, which is at one with nature and has been an inspiration to artists. Room for A Small Opera. 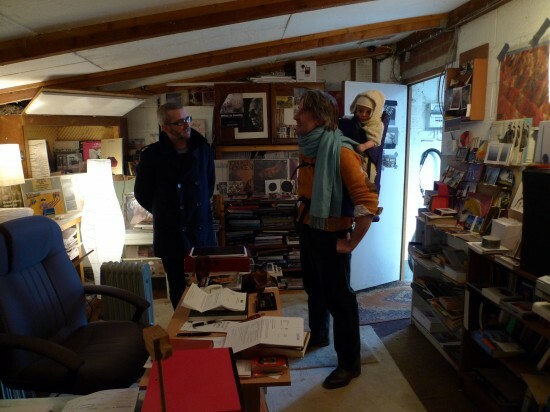 My studio is starting to resemble a “Room for a Small Opera” by Janet Cardiff and George Burres Miller, with vinyl records, old tapes and record players. Their work continues to fascinate me, and it was seeing their “Motet” piece, when in Barcelona a few years ago, which opened my eyes to Sound Art and its impact, leading to my current concerns at the interface between Painting, Sound, music and movement. In my studio there are many assembled archetectral objects, at the moment I am looking at them and listening to a great new visual album by Autechre . Suddenly they take on a new appearance. I have often used Architectural features in my work, especially within Collages and for pieces associated with Messiaen’s music. For instance, for a piece in the collection of the University of Oxford, I used a Norman motif of human heads transmuting into bird heads based on what I translated synaesthetically whilst seeing the music of the spectacular Turangalila Symphony. There are some beautiful flinted ruined churches in Suffolk, (where I used to live) and to which I often return. The decorative knapped flints often reflect the sky and are jewell like, particularly this time of year when the light is low. By these I have an old musical roll of “Waltzing Mathilda” a somewhat physical mechanical manifestation of music and a sentimental link with Australia and a wooden rule of my grandfather’s, which I remember being in his hands. Somehow, juxtaposed they contain additional meaning, and gain an extra resonance. The importance of these juxtapostions or “Curating” these objects, sounds and gestures was brought home to me further in a fascinating show I just went to see recently by the German artist Rosmarie Trockel, switching between media and author, and questioning the role of the artist today. I have for many years now been making maquettes with boxes. A year or so ago, I went to a space within a Lutyens building in London to an exhibition called the “Historical Box” curated by Maria McCarthy for Hauser and Wirth gallery, relating to a time of political and social activism and turmoil in the sixties. The work I remember most vividly was a black canvas box called “The War Room” by Wally Hendrick, who incidentally produced paintings via performances, and was a member of the Beat Generation. The box has been repainted for three conflicts. 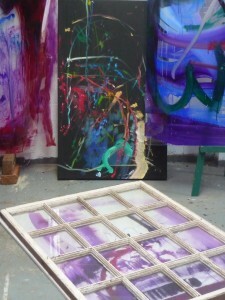 Inside the space, one can reflect on this process and the passage of time in a powerful way. I am currently in the process of making some large boxes of my own from sections of performances, so that they like Hendrick’s War room can become contemplative spaces in which to remember performances and moments passed. Each performance of my own has a lengthy and elaborate procedure and story of its own to tell. Some are unrealised and even fail to come off. I am starting to think that these and the stories they entail are in some way important in their own right. Some of my events have taken so long to organise, that by the time they have happened, I have often moved on with my ideas. I am in the process of documenting and writing them up presently. In a recent performance, I destroyed the work during performance, something I’d like to explore some more via film documentation, which is in itself becomes the only record of the process and product that is left. All my performances are by nature site specific, and I have been thinking of this also recently and how the performance is governed by the space and piece of music. Someone asked me at the beginning of my Creative Arts Fellowship at the University of Oxford what it was I did. When I explained, he said to me that I must do a lot of documenting. His words keep coming back to me at the moment. 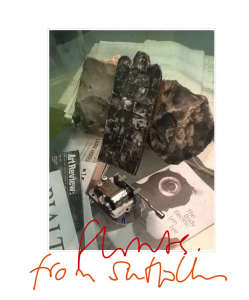 New Year I Pad Assemblages. 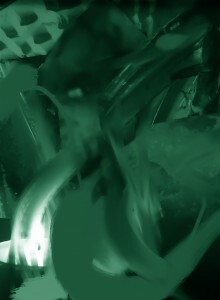 I have recently been working on my I Pad, on some images based around various pieces of Music. I have for a long time been collecting objects and making Assemblages, which for me resonate with various different musics. These particular pieces are derived from experimental soundscape music which I am enjoying at the moment by composer Mira Calix. Musical Assemblage Eyes Set against the Sun. Image, Nature and the Moment. Just the other day, I was invited to a private viewing of the Lithuanian filmmaker Jonas Mekas’s work. This great exhibition is currently showing at the Serpentine gallery and gives a glimpse into his working. In it there are passages of poetry, still’s of his numerous films, and documentation of his life. There was a beautiful new film installation, which contained snapshots from his life. During the first hour of being in the Serpentine, I became completely immersed in his world. Then I walked out of the room, and there was the great man himself, now nearing 90 years of age filming the private view and observing. It was as though the private view itself had become his studio. It made me think of poets such as Rimbauld and Baudelaire, their observations of life and more recently of poets like Bernard O Donoghue writing eloquently about displacement, being neither here nor there. At a Private View of John Gerard's work. The Serpentine show brought to mind an amazing great show I stumbled upon in Italy a few years ago of the visual artwork of Fredrico Fellini. In this case it was reams of sketchbooks and transparent workings of drawings of dreams. The great filmmaker was making sense of and drawing his dreams and in many cases then putting them into a film. I have recently been looking at Carolee Shneemann’s groundbreaking work from the 1960’s and 1970’s where life, process and performance become interlinked. There is an exhibition of Shneeman’s rather neglected work at the Richard Saltoun Gallery in London next month. Amazingly, her work has been left out of the “Bigger Splash “ show running at the Tate, which explores painting and performance. Seeing Mekas’s work also made me think of how art and life become as one. More powerfully though it made me think of how vital life itself is. In the woods near my house recently there have been the most spectacular mushrooms next to the solid 100 year old Oaks, due I expect to such a wet year in the UK. These Fungi burst from the ground momentarily beautifully and with such force which brings to mind the recent tragedy of colleague and friend Mike Stanley whose untimely and difficult memorial I attended last week. I can’t help but think of him as I look at wonderful mushrooms in a wood. The “Mushroom in the Forest” for the great poet Misrolav Holub was like an event, a symbol of upheavel. In the last couple of months I have experienced all this, the amazing experience and great joy of delivering my own son and experiencing great shock at losing old great friends and new ones suddenly. Life and nature feeling entwined as ever. Michael was a real support to me over the past few years. He took up the position of Director of MAO just as I became Creative Arts Fellow at the University. We met at the start of my tenure and over the past few years I have hosted talks with him and he was instrumental in, and helped bring about my performance at MAO last year. Aside from his great dynamic achievements and accolades as a director, he also had a rare empathy and real understanding of artists. I was really very fond of Michael and will miss him greatly. 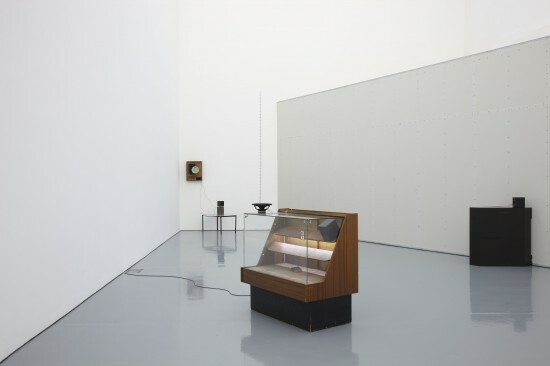 I greatly enjoyed talking to Haroon Mirza and as always with Michael Stanley this week. The discussion centred around Haroon’s fascinating work and the combination worked well looking closely at the wider context of Art, Sound and Music and their fascinating interconnections. Next week I am looking forward to discussing my own performances with Roger Redgate and Emmanuel Spinelli, exploring and translating sounds and music via painting, movement and improvisation, and the ideas and questions that have emerged. The evening will be a screening of excerpts of the recent Modern Art Oxford and South Bank performances that brought us together, with a discussion about how our disciplines have joined in this hybrid way. This will be the last event in connection with my tenure as Creative Arts Fellow at Wolfson College, at the University of Oxford. I am very much looking forward to a conversation between myself and the internationally acclaimed artist Haroon Mirza, and Director of Modern Art Oxford Michael Stanley about Haroon’s work and about the fascinating interelationship between Art and Sound. The talk is a continuation of a series of talks I have organised as part of my ongoing Creative Arts Fellowship exploring not only my own work but the crossing of the senses within visual art. In the last couple of months I have been continuing looking at the fascinating correlations between movements in and between art, music and dance and went to the terrific ‘Danser Sa Vie’ show at the Pompidou Centre in Paris where I particularly loved seeing the cross sensory work of choreographer Trisha Brown and Jan Fabre’s powerful piece with a naked dancer covered in Oil, juxtaposed with Klein’s body paintings and chiming with Pollock filmed by Hans Nemuth. Having the dancer being completely exposed, all barriers were completely removed between body, movement and process flowing as one. I have also seen a few terrific shows in London recently. The late Joan Mitchell’s at Hauser Wirth and a great show of Debuffet’s in Waddington’s both, which would have been made even better with a bit of music and sound. Debuffet apparently made music himself collaborating with Asger Jorn. I was talking with the great Art Historian Richard Cork following a talk with him at Wolfson College on the inter-relationship of Music and painting. Someone afterwards mentioned how some of the paintings would have made more sense with music and the idea was floated of showing paintings with music in separate rooms. This I believe has not been explored much. A few years ago I took part in a touring show called ‘Eye Music’ which contained work by Kandinsky, Klee, and more. This could have benefited greatly from some music filtering through the rooms. It would demand a lot of space but would be great I reckon. Performance Painting at the Royal Academy of Music to Music by George Crumb. On a musical note I have been listening to some George Crumb to whose little pieces I painted (See above) to a while ago and of Vlinko Globkar’s fascinating work and I’ve been joyously rediscovering the sensitive afro American improvisations of the 1970’s by artists such as Sam Rivers and Don Pullen. This revolutionary Organic and under sung music sets up huge all encompassing complexities of colour and timbre which really appeals to me. The other night I became aware about the extraordinary Bowerbirds of Australia, which collect objects of the same colour. I can imagine them flying over those vast distances bringing colours back to their nests. In my studio I find myself over the years doing something similar gathering objects, whether it being flints, album covers and wee boxes. A few weeks ago it was unseasonably warm which meant that in the evenings I could open my studio in the woods and look at it from a far, a bit like when you step back from a painting. This also coincided with the planets Venus and Jupiter being incredibly bright. The light made it almost possible and tangible that the light of my studio and the planets were in some way connected. Messiaen Colours. Collection of St Hugh's College, University of Oxford. I have been continuing my obsessional fascination with Tarkovsky films too lately and in particular the magnificent Rublev about the great Russian Painter, and drawing analogies with the poems by the Czech Immunologist turned poet Miroslav Holub. The filmmaker and poet both enable this tangible feeling of tremendous scale, from the particular to the enormous, the microscopic to the grandiose and like the glorious music of Messiaen, in particular the Colours de la Cite Celeste the colour of the particular and the vastness. 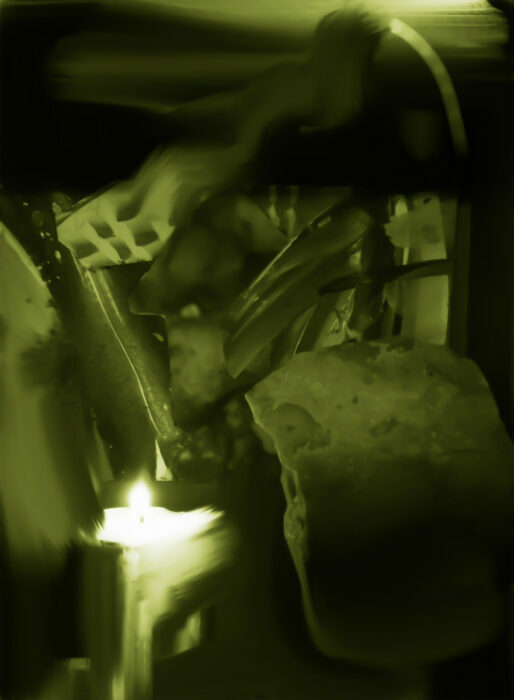 Through re watching my latest performances, these concerns are reflected and picked up upon in the relationships between small objects and enormous gestures. My own practise of Buddhist Kum Nye Meditation similarly reflects this moving between the small, slow and micro movements to the huge expansive and all encompassing. Small devices, objects and painting. 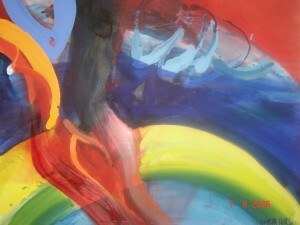 ‘Collision’ Talk at Wolfson College, 5.15pm.8th March 2012. Rowan-Hull will talk with Michael Berkeley and Kevin Laycock on their visual/Music collaboration. 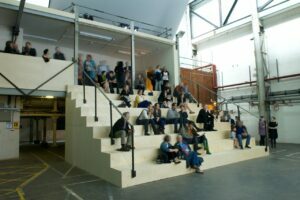 A Screening of the work will take place as part of the event.